But the Chinese government needed help develop the algorithms that determine social credit scores. So it enlisted eight companies for pilot programs, including its two largest, trusted social media companies: Tencent and Alibaba. They both came up with their own solutions: Alibaba’s affiliate Ant Financial rolled out its own “Sesame Credit” system. And Tencent had a nationwide system that was trialed for less than a day before it was taken down with pressure from the People’s Bank of China. Both Alibaba and Tencent own enormous Chinese payments systems. They also own the largest Chinese marketplaces. So Tencent’s program and Alibaba’s Sesame Credit can easily measure how much, how often, and what is bought online in China… and more importantly, when it is paid for. Chinese regulators are pressuring both as neither have received an official licence to operate their social credit systems. But Tencent and Alibaba are pushing aggressively because they see the benefits – these seemingly innocent systems could help bring order to the chaos of Chinese commerce. The plan, however, does not stop there. And the Chinese government has already laid the framework for the dystopian future. Laws from 2012 and 2016 require internet companies to retain customers’ real names and information. There will be no opting out from this future. In 2020, the system will become the Social Credit System (SCS). And it will be owned and operated entirely by the Chinese state government. The SCS will take into account not only purchases, but also hobbies, your lifestyle, and even who you hang out with. If you raise a child, attend government events, or do well at your job – things considered ideal for a model citizen – your social credit score will go up. If you drink too much, play too many video games, or speak ill of the government – your social credit score will go down. It’s a national database that will hold information on every citizen. It will assess information as innocent as whether an academic degree was actually earned. And as personal as if a female is supposed to be taking birth control. In short, the SCS will not be a measurement of how regularly you pay your bills. It will show the government precisely how well you toe the party line. It’s a great idea, right? There are a lot of people in China. And it’s hard to prevent crime. Citizens know exactly how trustworthy someone is before they befriend them. Bad driving gets punished (if you have ever driven in Vancouver, Canada-this would be a welcomed feature). While good driving gets rewarded. People become more confident in public institutions. You’ll be able to rent better cars and homes, without a deposit. Your children will have access to the best schools in your area. You’ll get access to better health insurance. Prospective employers will be more likely to hire you. It’ll be easier to get the paperwork to travel or to get a loan. But that’s only looking at the benefits for people with a high score. If your credit score drops too low, you’re basically ejected from society. You’ll be rejected for housing and loans. Your children won’t be able to attend good schools – even if their grades say otherwise. You’ll have a harder time finding a date (dating sites and apps in China allow people to advertise their social credit score). You’ll be turned away from good job opportunities. Your internet speed could be cut. Or, like Zhang, you’ll be locked out of being able to buy train tickets and plane tickets. You won’t be able to leave the country. In effect, the SCS is designed to completely eliminate mobility – social, class, or travel – for those who do not agree with the government’s definition of a model citizen. If the punishments are so severe, surely it must be hard to get a low score. Only for horrific crimes, right? Punishment is already happening on a broad scale. Chinese authorities have already banned more than 10 million people deemed “untrustworthy” from boarding flights and high-speed trains. It’s actually really easy to watch your SCS drop. Hang out with someone with a low score, and your own will go down. You can lose points based on spending time with your family and friends. By the way, that’s how North Korea keeps its citizens in line. It gets worse. When you check your score, you can see precisely who is dragging it down. So you know instantly who to avoid in your life. Here’s the kicker: The Chinese people seem to want this system. It’s perfectly gamified, after all. People want to participate in the system to watch their score go up. They’re also unknowingly participating in a system of ostracism and social pressure. The social credit system is a tool to get people to fall perfectly in line. It’s not mandatory yet. Which means that all the people who want to do it – the ones who willingly toe the party line – are going to get in early to get super high scores. It will seem innocent. Fun, even. The social credit system is not scheduled to reach full nation-wide implementation until next year. But parts of it have already been put into play. Last year, 17 million flights and 5.4 million high-speed rail trips were denied to would-be travelers who found themselves on the government’s blacklist. It’s said that most of the people on the blacklist are debtors. These are people who have defaulted on loans. And some of the current implementations of the social credit system only deduct social credit points when you break the law. Like getting a speeding ticket. Again, there’s a Sesame Credit app, which encourages users to compare their credit scores to those of their friends. It’s an obvious push to get people to share their ratings as a status symbol. More than 100,000 Chinese people have “tweeted” their SCS scores on the Chinese equivalent of Twitter. 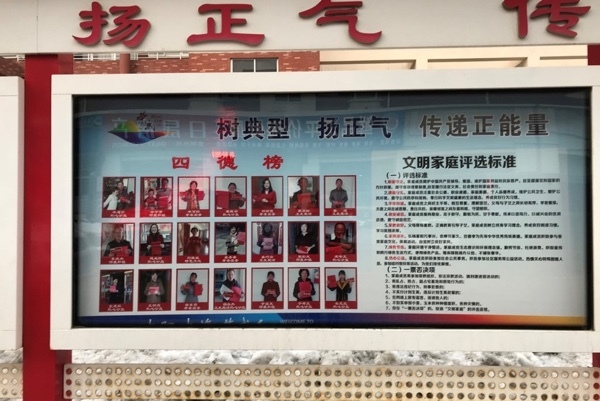 Above: A billboard in a Chinese community displays citizens with the highest social credit score. The madness has not yet begun. The logical implications of the system are horrifying to think about. You can literally die a death by a thousand paper cuts. Buy the wrong thing on Alibaba too many times, and you can no longer even get a job. Hang out with the wrong friends too many times, and you can’t get a loan or trade in the stock market. And once you’re out of society, you’re out for good. There’s virtually no way to get back in. You’re muted and invisible. Persona non grata. It’s an appalling return to the caste system of India. If your credit score is too low, you’re untouchable. That’s a page straight from Soviet Russia’s KGB – only more effective. Accurate information on China is hard to obtain. It’s likely the current reality is already far worse than we know. The majority of the elements are in place for the Social Credit System to be implemented. Think about it. China started with Alibaba and Tencent. In the United States, we have Amazon and Facebook and Google. They know everything you read, see, search, buy, and say. Your Android or iPhone already tracks your location and reports it hundreds of times per day. And that information is already being used for complete censorship. In 2018, Facebook began a program that assigns every user a reputation score, which predicts their “trustworthiness.” Sound familiar? They subjected all online behavior to intense study. They collected, stored and analyzed all social media and banking information. They began to severely regulate the freedom to travel. Police threat-scoring algorithms are used to determine who the police should be tracking and surveilling. Social media is already being used in these algorithms. For the past decade, the NSA has been gathering information on people’s social media, locations, friends, and who they travel with. The agency can enrich the data with bank information, social media information, voter information and even GPS location information. The TSA has a rapidly expanding “no-fly” list. The list has no government accountability, and there is no recourse – unless, of course, you’re a powerful government official who ends up on it. Never underestimate the currency butterfly effect. This has huge implications for the yuan, which is the currency of China. The Social Credit Score will have incredible implications on business, government and ultimately, the strength of the currency. The world has never seen anything like this. And it’s only going to grow. China is the first country to implement this and certainly won’t be the last. You know others will do so to maintain power, increasepower and manipulate power. Pay attention to this and it will be very important in the coming years, and will have significant indirect effects to your portfolio. Imagine all of your assets suddenly disappearing because a red light camera read your license plate wrong. The infrastructure for this system is already in place in the United States. It’s just not about train rides or university classes anymore. Any individual not aligning with the current social and governmental norms will face poverty… homelessness… starvation… or worse.